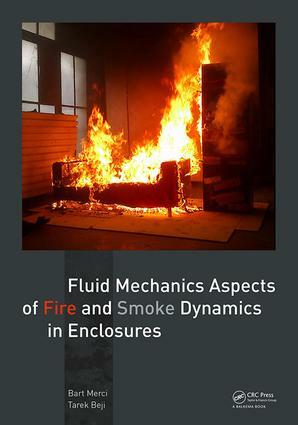 This book aims at fulfilling the need for a handbook at undergraduate and starting researcher level on fire and smoke dynamics in enclosures, giving fluid mechanics aspects a central role. Fluid mechanics are essential at the level of combustion, heat transfer and fire suppression, but they are described only cursorily in most of the existing fire safety science literature, including handbooks. The scope of this handbook ranges from the discussion of the basic equations for turbulent flows with combustion, through a discussion on the structure of flames, to fire and smoke plumes and their interaction with enclosure boundaries. Using this knowledge, the fire dynamics and smoke and heat control in enclosures are discussed. Subsequently, a chapter is devoted to the effect of water and the related fluid mechanics aspects. The book concludes with a chapter on CFD (Computational Fluid Dynamics), the increasingly popular calculation method in the field of fire safety science. "Using this book people can learn to understand how fires developed and how they can be controlled. The book transfers knowledge from general fluid dynamics and combustion science to the area of fire safety science. Using this approach the accuracy of the prediction of fire will be higher than in traditional approaches more based on empirical correlations. The approach taken in the book is forward looking. The book will be relevant for a long time." "Merci and Beji’s new book on fire dynamics with emphasis on the fluids mechanics aspects is a solid contribution to the literature in the field. Its comprehensive discussion of fluid mechanics principles applied to plumes, fire behavior in enclosures and CFD models is unparalleled. The book could be used as a text for use in fourth year undergraduate or first year graduate level courses or as a high level review for fire safety researchers and engineers. [It is] a valuable addition to the library of any fire safety researcher or engineer." Prof. Jim Milke, University of Maryland, in 'Fire Science Reviews'. This will be a challenging textbook for an upper-level undergraduate course in a related STEM field, but it is highly recommended for a graduate-level elective course and more so as a comprehensive handbook for practicing engineers in fire dynamics analysis, fire suppression, and fire safety risk analysis. Summing Up: Highly recommended. Graduate students; faculty and professionals." B. Tao, Wentworth Institute of Technology in 'Choice', February 2017 issue. Prof. Bart Merci obtained his PhD, entitled ‘Numerical Simulation and Modelling of Turbulent Combustion’, at the Faculty of Engineering at Ghent University in the year 2000. As postdoctoral fellow of the Fund for Scientific Research – Flanders (FWOVlaanderen), he specialized in numerical simulations of turbulent non-premixed combustion, with focus on turbulence – chemistry interaction and turbulence – radiation interaction. He reoriented his research towards fire safety science, taking the fluid mechanics aspects as central research topic. He became lecturer at Ghent University in 2004 and Full Professor in 2012. He is the head of the research unit ‘Combustion, Fire and Fire Safety’ in the Department of Flow, Heat and Combustion Mechanics. Since 2009, Bart Merci coordinates the ‘International Master of Science in Fire Safety Engineering’, with Lund University and The University of Edinburgh as partners. He has been the President of The Belgian Section of The Combustion Institute since 2009 and Associate Editor of Fire Safety Journal since 2010. He is member of the Executive Committee of the International Association for Fire Safety Science. He is author of more than 100 journal papers.